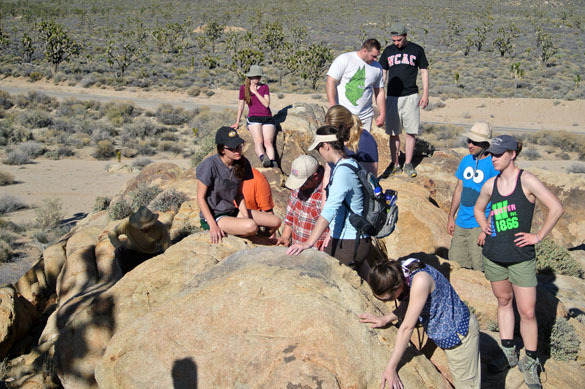 ZZYZX, CALIFORNIA–Today the Wooster Geologists explored the Mojave National Preserve. It is a beautiful, spacious, diverse place well maintained and protected by the National Park Service. Our first stop of the morning is shown above. 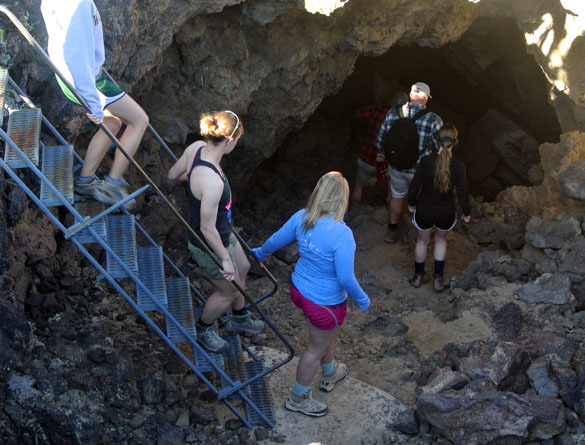 We explored a lava tube in the cinder cones portion of the preserve. We descended into the dark tunnel by the steps above, and then studied the walls and ceiling with our flashlights, as Melissa Torma is doing below. 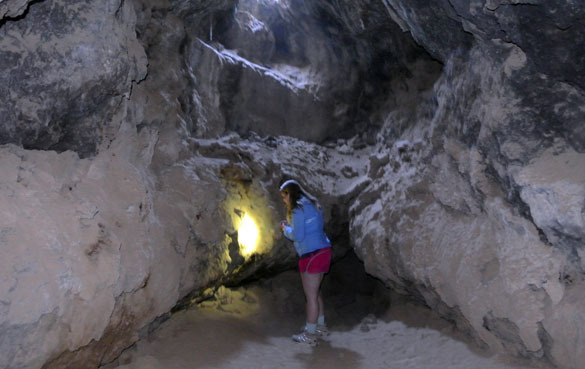 Lava tubes are formed when a lava flow cools on the top and sides, and then the remaining lava flows out, leaving behind the empty shell. In this particular lava tube we could see various level markings the lava left on the walls as it drained away. We also saw spatter and “lavacicles” hanging from the ceiling much like icicles or stalactites in a cave. My favorite part is where we can see from below a granitic boulder that was caught up in the flowing lava. South of the lava tube along Kelbaker Road is a small outcrop of Cambrian limestone. We examined these rocks for a short time (above) to sort out their lithologies and the paleoenvironment in which the sediment accumulated. The clues included extensive and diverse horizontal burrow systems (shown below) and numerous oncoids with shelly nuclei. 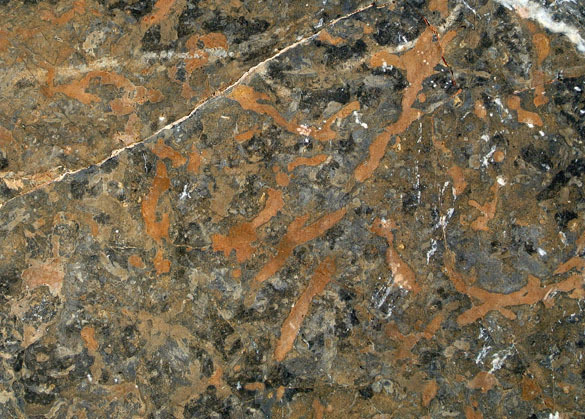 The students determined that the burrows were filled with dolomite from later diagenesis of the sediment, and that the oncoids showed the system was deposited well within the photic zone. We think this rock is a biomicrite formed around the storm wavebase on a shallow carbonate platform. 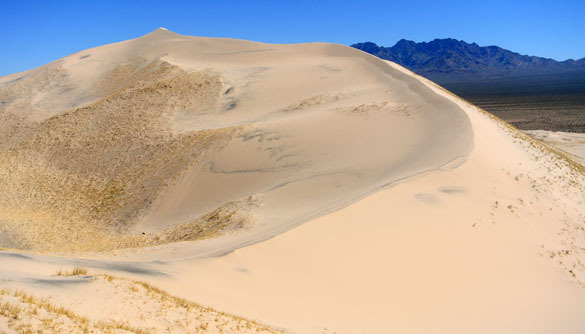 One of our favorite places is Kelso Dunes. These massive piles of sand are stabilized at their bases but still moving about at their crests. We’ve studied them so many times in the Desert Geology and Sedimentology & Stratigraphy courses that we needed to say little about them. The students raced to the top, noting the diverse sand composition (so much more than just quartz) and eolian structures on the way. 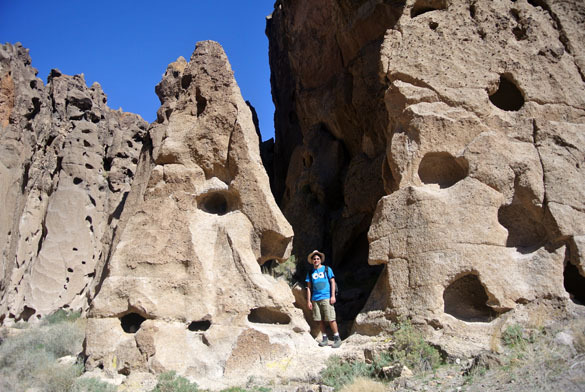 Ananda Menon is here showing us one of the magnificent tuff beds at the Hole in the Wall locality in the easternmost portion of the Mojave National Preserve. The holes in the wall (is that how the place was named?) are examples of tafoni, a rock weathering pattern. We hiked the Rings Loop Trail examining the tuff units and their diverse clasts, including pumice and charcoal. We also saw good examples of Indian petroglyphs of unknown age. 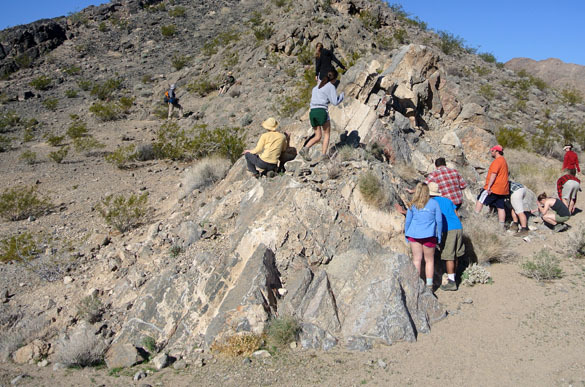 While crossing Cima Dome on the way back to Zzyzx, the group visited an outcrop of quartz monzonite which forms at least part of the intrusive body under the uplift. As with most of our outcrops, it was a story of both petrology and structural deformation. Finally, at the end of the day I could not resist taking the Wooster Geologists to the unique store in Baker called “Alien Fresh Jerky“. Half the group loved it, the other seemed offended by the epic cheesiness. 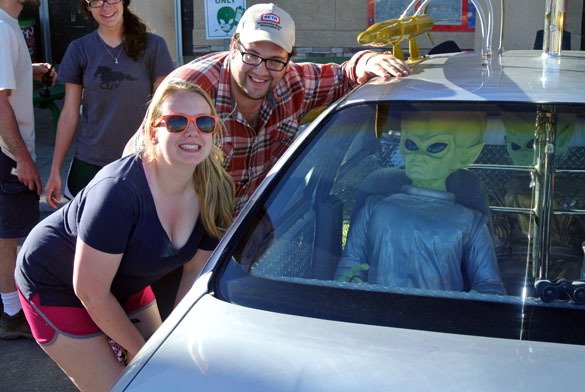 At least Melissa Torma and Jonah Novek enjoyed meeting members of the Galactic Peace Patrol parked in front.